Scheduled to open on 24 September, the second edition of the International Arab Film Festival in Gabès, Tunisia, will have the Egypt-based the 23-awards-winning Tunisian actress Hend Sabry as its honourary president. According to MAD Solution, Egypt-based film PR company, Sabry said that "The festival belongs to the south of Tunisia, which is where I belong, and that makes me feel very delighted. I hope for the festival to be a new star that shines in the sky of the Tunisian and Arab culture, a cultural hub and a new platform for the Arab cinema." "I believe in cultural decentralization. I believe in the importance of having diverse cultural centers that are also interconnected, like guiding stars in every city and every village so that darkness won't prevail, and that is basically what the festival aims for." Last winter, Sabry served on the jury panel at the 45th International Film Festival Rotterdam. In 2015, she served as a jury member of the 4th IWC Filmmaker Award as part of the 12th Dubai International Film Festival. 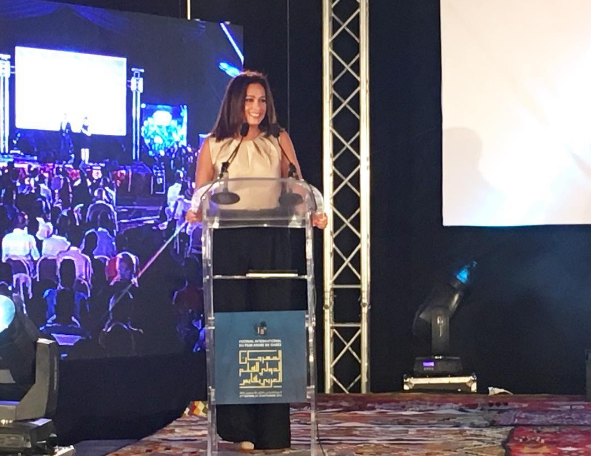 She was also appointed the Honourary President of the 1st International Arab Film Festival in Gabes. In 2012, Sabry took part in the 2nd TROPFEST Arabia, the world's largest short film festival, as the Festival Co-director. The same year, she headed the Feature Narrative Jury at the Doha Tribeca Film Festival. Sabry, 36, is among the most popular actresses in the region, and has been based in Egypt for years where she is a regular fixture in local films and TV series. Her career began in 1994 at the age of 14 when she debuted in the Tunisian production Silence of the Palaces (Samt Al-Qosoor) by director Moufida Tlatli. Her first appearance in Egyptian cinema was in the 2002 production A Teenager's Diary (Muzakirat Murahiqua), a role that paved her way to stardom. Her later roles include starring in films such as A Citizen, a Detective, and a Thief (Mowaten we Mokhber we Haramy) in 2002, Downtown Girls (Banat West El Balad) in 2005, and Ibrahim El-Abyad in 2009. She also appeared in The Yacoubian Building (Oumaret Yacoubian, 2006), alongside an extensive cast of Egypt's biggest stars. Her embodiment of an HIV positive woman in Asmaa (2011) brought her several awards. Apart from her many achievements in the cinema, Sabry is active in social and humanitarian work. Since 2009, she has been working closely with the UN World Food Programme on raising awareness about hunger in the region. In 2010, Sabry officially became a WFP regional ambassador against hunger. Taking place between 24 and 30 September, the International Arab Film Festival in Gabès will also honour the late iconic Egyptian director Mohamed Khan who passed away earlier this year.